Although I wrote everything I know about squirrel issues for this website, oftentimes a problem with squirrels in the attic is beyond the scope of the do-it-yourself homeowner to solve. I have found a professional company in San Francisco, California that handles problems with wildlife. 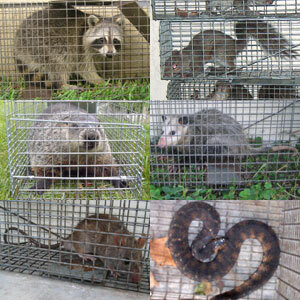 Mighty Men WildLife Trapping & Rodents has access to tools, techniques, and experience that help them do a far better job at wildlife removal than a non-experienced homeowner could. They possess licensing that allows them to do certain types of work legally, that non-licensed homeowners in the state of California are not allowed to do. For the welfare of your situation, and the squirrels, in some cases it's best to hire a pro. There are good companies and bad companies out there. I've done research on such companies, to get to know them, and feel confident recommending their services. I therefore recommend a company called Mighty Men WildLife Trapping & Rodents which services San Francisco, California. If you have a squirrel problem, or any other conflict with a wild animal, and live in San Francisco, I am confident that this company, Mighty Men WildLife Trapping & Rodents, is the one to call. I asked the company to describe their service range, and they said this - Servicing San Mateo County and surround areas. We work on the west side of the bay, from Sausalito to Daly City, South San Fran, San Bruno, Pacifica, Millbrae, Burlingame, San Mateo, Foster City, Belmont, Redwood City, and Menlo Park. We service San Francisco and San Mateo Counties. Mighty Men WildLife Trapping & Rodents operates 24/7, so don't hesitate to call at any time to discuss your wildlife problem, and schedule an appointment for same-day or next-day service. Hi David, I came across your website, and hope you can help me with my question. I happen to be a squirrel-lover, and have taken to feeding the squirrels in my yard, who are now (obviously) feeling quite at home around my deck area. My husband is worried (read:extremely angry and upset) that they will break into the house and set up shop, causing damage to wires, insulation, and all of the things that you mention on your website. My question is: is there a way to prevent this and still be squirrel-friendly? Like, can I squirrel-proof our house? We have a big house (3,000 sf+) in a wooded area, tons of trees, as well as a detached garage. I'm assuming squirrel-proofing (if possible) would be cheaper than repairing squirrel-damages, and cheaper than the divorce lawyer I'd probably need if they get in the house, since he's already not at all happy about my feeding them. Any advice you can share would be appreciated :) Lynn :) p.s. I no longer feed them on the deck or put food in the birdhouses in the trees next to my house--have moved the feeders across the yard closer to the detached garage...still in seeing distance, I must admit, but much (well...a lot) farther away. Hi David, I am renting an apartment that is connected to a bar/eatery in San Francisco When we moved in two ears ago I noticed insulation around pipes in our stairwell, that matches the chew marks of the squirrel's damage in your photos. I also used to work for the owner of the bar and the building I live in with my three children. We noticed one year ago squirrels on his roof and coming in and out of a large hole right under his gutter, just like in your pictures. The owner called two different pest control companies. They caught two squirrels, on the ground in traps but did not go into the attic where we see them going in and out of, or come to look at the damage in my apartment. Here we are a year later, and I am smelling a pungent odor in my hall closet, and finding more holes chewed through the wall bordering the side of the bar's attic. There are holes chewed through under my kitchen sink from a subfloor of some kind and the smell of what I suspect to be squirrel urine is there too. Pest Nuisance isn't calling back, the owner said he has called since Monday. I am very concerned with children up here and what may be or is in the walls and floor. I have even seen a bushy tail down in the hole under the sink. I removed the garbage and have tried to clean on the surface, but I am learning the problem can be much deeper. Please send any advice or help you may be able to. Thank you Kindly. Truly, Meredith. If you have a squirrel problem in San Francisco County California, or any other conflict with a wild animal, I am confident that we can solve it. We use humane methods when dealing with San Francisco wildlife removal situations. Squirrel Control San Francisco. Our company is fully licensed and insured in California. Call us any time at 415-481-0753 for a price quote and to schedule a same-day or next-day appointment to solve your squirrel problem in San Francisco.